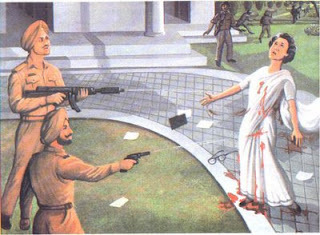 THE ROAD TO KHALISTAN: WE REMEMBER 1984 - MASSACRE BLUESTAR - THE THIRD GHALUGHARA - THE AFTERMATH. 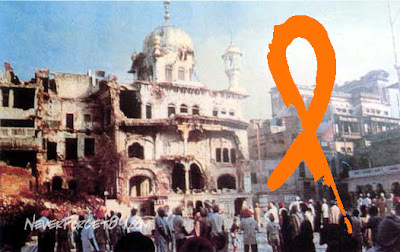 WE REMEMBER 1984 - MASSACRE BLUESTAR - THE THIRD GHALUGHARA - THE AFTERMATH. If the Indian government has ever acknowledged that Operation Woodrose was a reality, I haven't heard of it. It was, for those who may not know, an attempt to exterminate all the young Amritdhari Sikhs (the Rose) in the Punjab (the Wood). This was brutally carried out. 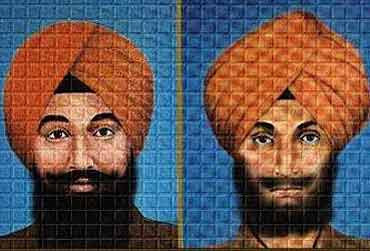 Young men wearing turbans, mostly between the ages of 15 and 30, and also some young women were round ed up and tortured and shot or they simply disappeared. It is estimated that approximately 150,000 of our best young men and women were murdered by the Indian government at this time. The pictures of this genocide are particularly gruesome, as indeed, genocide tends to be. I reproduce only one here, from the Sikh Lionz website; we believe it will suffice. We are astonished at the lack of information about Operation Woodrose. We are not trying here to be unbiased. How can we possibly be when we see our brothers and our sisters, our sons and our daughters, our friends whom we love so dearly reduced to bloody corpses to satisfy the hunger of prejudice and injustice. May their blood truly water and provide nourishment for this beautiful flower we call the Khalsa. Which cut short [that woman]'s ultimate plan, her 'Final Solution' to the Sikhs of India, Operation Shanti by two more of our shaheeds. Followed by the savagery in Delhi and elsewhere. We will talk about that in October and November, as it happened. Thank you for your detailed and thoughtful comments. 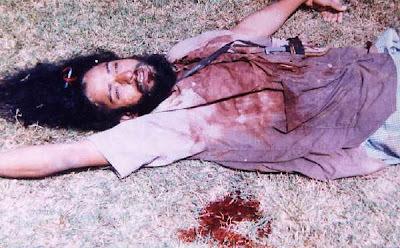 The fact is, whoever the gentleman in the picture is, many innocent young Amritdhari Sikhs were murdered by the police during Operation Woodrose. I know because some of them were relatives of mine, some by blood, some by marriage. I do not hate Hindus. I hate what has been done to us Sikhs by some Hindus. Numbers, of course, are not the main thing, but that is 1000s of innocent Sikhs, even 10,000s of innocent Sikhs, not 100s. Just a thought, of that 90% of Sikhs you know who consider India their homeland, how many would tell you if they didn't consider India their homeland? Just a thought. ...now before sikhism came into existence we were all the same people from the same land isn't it and this includes almost all of pakistan and parts of afghanistan as well...( beneath the long beard and the turban, we are really the same people...i am sure even dna analysis will prove that)..........many hindu saints and learned people came from the same land 1000's of years before sikhism was born ..
.. so basically we (hindus and sikhs) have full respect for each other's religion.....there are a lot of similarities in us and quite a few differences as well but that is ok..however the fact is we are in a way inseparable due the fact that our roots are the same..so like it or not..we have to learn to live with each other on this land..
lets try to understand the sentiment behind Khalsitan..
i would like to put in a few lines of a poem..
Doosron ki jay se pehle ..
lets try to conquer over ourselves..."
"by the way i am a hindu, my wife is a punjabi ,it was a love marriage :-) and we go to the temple as well as the gurudwara on a regular basis"
mai my sister...my only motto in life is to exterminate anyone who spills the blood of innocents in the name of religion ,politics or money....this includes those hindu rioters who shattered your family...they are not hindus they are terrorists...and i will kill them...thankfully a majority of hindus are not like them....its not about hindus or sikhs...its about extremists...we don't need them...i will exterminate them..
Dear Anonymous Commenters - How hard it is to relive all this. The fact is that some of my ancestors were Punjabi and some were not - but none were Indian, because India did not exist at the time. I try to carry no bitterness in my heart, not because I am so good, but because I believe that "Bitterness is like drinking poison and expecting the other person to die." The truth, though, is spoken by the most recent Anonymous. I am a lioness, I am not a sheep. Like my sisters and brothers, I may survive in this cage, but I do not thrive in a cage - I long for freedom. "India" will someday fall apart. We will be there to pick up the pieces of our homeland, promised to us by Nehru and Gandhi. Time is on our side. I believe you are wrong; only time will reveal the Hukam of Vaheguru in this matter. We must wait for Her Will to be expressed. BTW, who are you. I do, of course, allow anonymous comments, so people will feel free to express themselves, and you need not answer. I do, however, use my own name and feel we have gotten to know each other beyond a blase "Anonymous." Heeou Anon Guy, The right-wing Hindu crowd of your ilk caused the separation of Bharat Mata in 1947. The same crowd is treating Bharat Mata very badly again. Bharat Mata is not happy. She is suffering in pain. I personally never liked the nehru gandi family myself. But i do not have the power to change the past. I have no right to judge anyone from the past nor will i make any comments.. I jus love my land and will serve it as much as i can. Dear Manpreet Singh ji - What you say is true. I agree 100%. If you have not heard what I'm writing here before, it is because the guardians and protectors chosen by your mother, the government, have let her down and chosen to lie to you, or at the very least, keep the truth of your mother's history and misdeeds from you. So I am performing a necessary service. I am glad my words sicken you...cause you horror; that means your humanity is still intact. I think only a psychopath could read what happened to us without wanting to puke. BML, we all change the world by a greater or lesser degree. The question is how much and in what way. Dear BML - One further question. You visit the gurdwara sahib, very good. As you are a hindu brahmin, I am curious if you enjoy the food and fellowship of the langar, sitting on the floor equal to whoever happens to show up. Heeou Anon Guy, The best way to love your land is to cure your stupidity and not write nonsense. Get it? Stupidity is a form of sickness. By writing on the net you are making other Indians sick. My 'frend' and brother ji - As I do not indulge in the barbaric practice of consuming the carcases of dead animals I would have to say...the Eagle-Hawk. i have done that with full devotion and i have loved every bit of it. mr manpreet singh...you are tellign me to get teh facts right...do you have any facts to start with..? guru nanak the first sikh was born to hindu khatri parents..can you dispute this fact? Youre a most unusual brahmin who does not follow the beliefs of your own religion. And you still believe in caste. and let me tell you that majority of the hindus are like me..
i guess it is you who needs to grow up and try not to hate.. I have asked the cyber security guys to track your Ip address and get you behind Bars. Save yourself.. Yours Hacker!! to the rat-infested place you call a country.